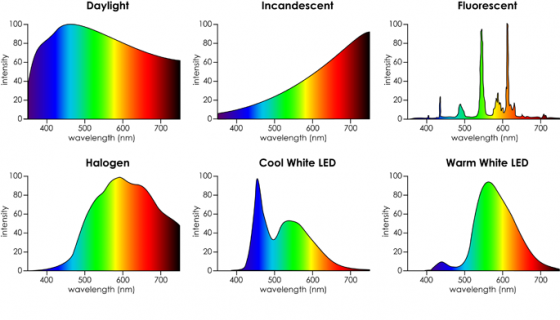 Many light sources we come across today have a CRI rating. Most of us realise that the higher the number, the better the quality of light, but is it really that simple? What exactly is Colour Rendering Index, how is it measured and can we trust it as cinematographers? Let’s find out. CRI was created in 1965 by the CIE – Commission Internationale de l’Eclairage – the same body responsible for the colour-space diagram we met in my post about How Colour Works. The CIE wanted to define a standard method of measuring and rating the colour-rendering properties of light sources, particularly those which don’t emit a full spectrum of light, like fluorescent tubes which were becoming popular in the sixties. The aim was to meet the needs of architects deciding what kind of lighting to install in factories, supermarkets and the like, with little or no thought given to cinematography. Fluorescent and LED sources, however, have huge peaks and troughs in their spectral output, with some wavelengths missing completely. If the wavelengths aren’t there to begin with, they can’t reflect off the subject, so the colour of the subject will look wrong. Analysing the spectrum of a light source to produce graphs like this required expensive equipment, so the CIE devised a simpler method of determining CRI, based on how the source reflected off a set of eight colour patches. These patches were murky pastel shades taken from the Munsell colour wheel (see my Colour Schemes post for more on colour wheels). In 2004, six more-saturated patches were added. 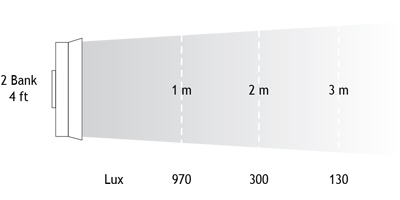 Illuminate a patch with daylight (if the source being tested has a correlated colour temperature of 5,000K or above) or incandescent light (if below 5,000K). Compare the colour of the patch to a colour-space CIE diagram and note the coordinates of the corresponding colour on the diagram. Now illuminate the patch with the source being tested. Compare the new colour of the patch to the CIE diagram and note the coordinates of the corresponding colour. Calculate the distance between the two coordinates, i.e. the difference in colour under the two light sources. Repeat with the remaining patches and calculate the average difference. There have been many criticisms of the CRI system. One is that the use of mean averaging results in a lamp with mediocre performance across all the patches scoring the same CRI as a lamp that does terrible rendering of one colour but good rendering of all the others. 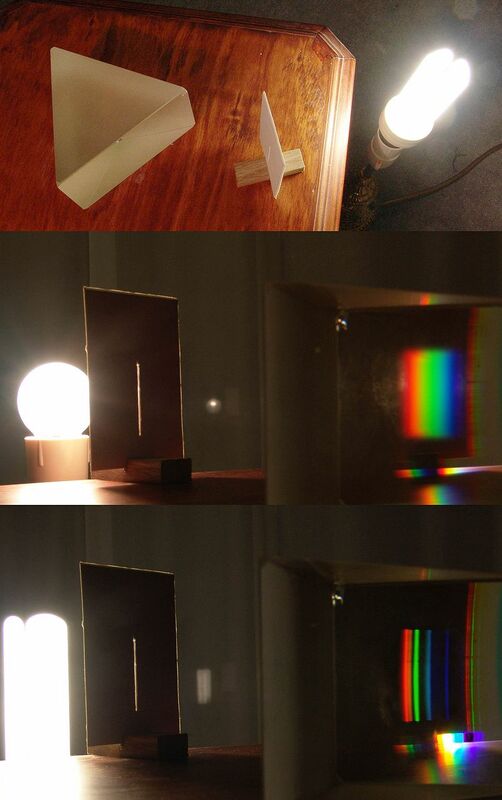 Demonstrating the non-continuous spectrum of a fluorescent lamp, versus the continuous spectrum of incandescent, using a prism. Further criticisms relate to the colour patches themselves. The eight standard patches are low in saturation, making them easier to render accurately than bright colours. An unscrupulous manufacturer could design their lamp to render the test colours well without worrying about the rest of the spectrum. In practice this all means that CRI ratings sometimes don’t correspond to the evidence of your own eyes. For example, I’d wager that an HMI with a quoted CRI in the low nineties is going to render more natural skin-tones than an LED panel with the same rating. 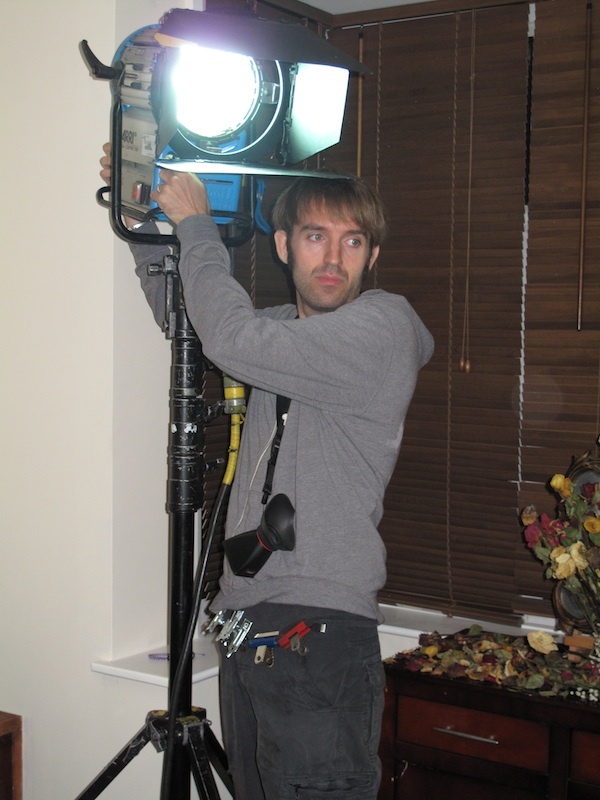 I prefer to assess the quality of a light source by eye rather than relying on any quoted CRI value. Holding my hand up in front of an LED fixture, I can quickly tell whether the skin tones looks right or not. Unfortunately even this system is flawed. The fundamental issue is the trichromatic nature of our eyes and of cameras: both work out what colour things are based on sensory input of only red, green and blue. As an analogy, imagine a wall with a number of cracks in it. Imagine that you can only inspect it through an opaque barrier with three slits in it. Through those three slits, the wall may look completely unblemished. The cracks are there, but since they’re not aligned with the slits, you’re not aware of them. And the “slits” of the human eye are not in the same place as the slits of a camera’s sensor, i.e. the respective sensitivities of our long, medium and short cones do not quite match the red, green and blue dyes in the Bayer filters of cameras. Under continuous-spectrum lighting (“smooth wall”) this doesn’t matter, but with non-continuous-spectrum sources (“cracked wall”) it can lead to something looking right to the eye but not on camera, or vice-versa. 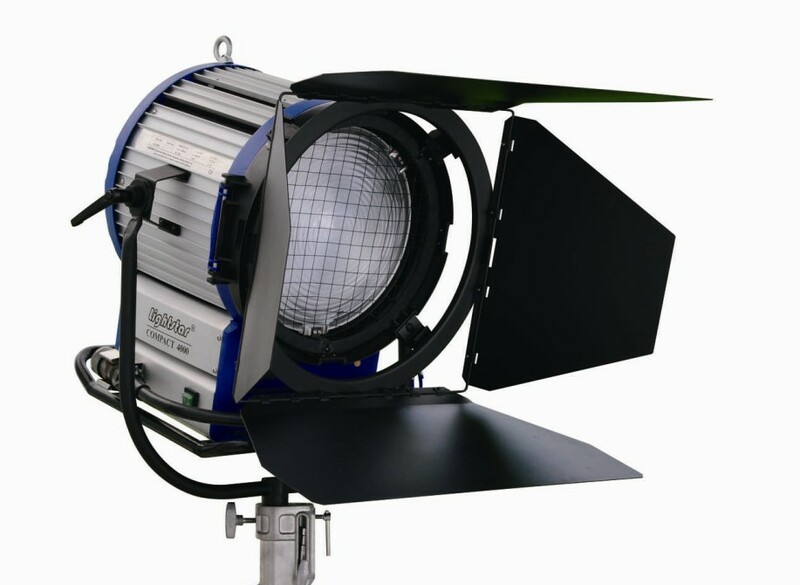 Given its age and its intended use, it’s not surprising that CRI is a pretty poor indicator of light quality for a modern DP or gaffer. 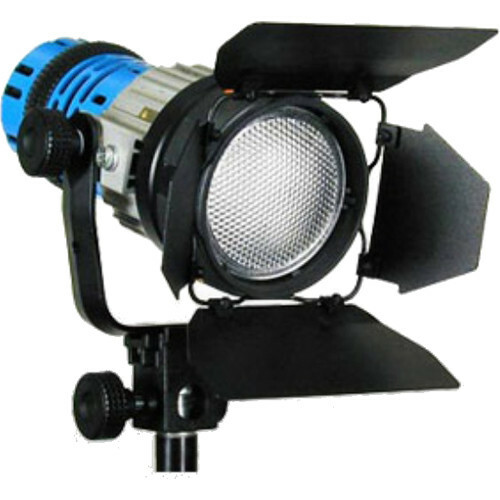 Various alternative systems exist, including GAI (Gamut Area Index) and TLCI (Television Lighting Consistency Index), the latter similar to CRI but introducing a camera into the process rather than relying solely on human observation. The Academy of Motion Picture Arts and Sciences recently invented a system, Spectral Similarity Index (SSI), which involves measuring the source itself with a spectrometer, rather than reflected light. At the time of writing, however, we are still stuck with CRI as the dominant quantitative measure. So what is the solution? Test, test, test. Take your chosen camera and lens system and shoot some footage with the fixtures in question. For the moment at least, that is the only way to really know what kind of light you’re getting. With increased distance, the light emitted from a given point source will fall rapidly, as it spreads over a progressively larger area. This fall-off in light level is inversely proportional to the distance square, i.e. 1/d². Thus, doubling the lamp distance would reduce the light to ¼. The operative word, for our purposes, is “spreads”. Each light ray (dodgy term, I know, but sufficient for our purposes) retains the same level of energy, and there are the same number of them overall, it’s just that there are fewer of them passing through any given area. 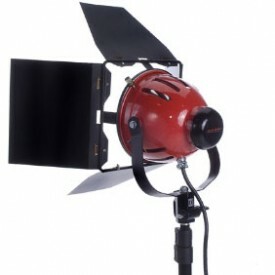 During season two of my YouTube series Lighting I Like, I discussed Dedo’s Panibeam 70 HMI. This fixture produces collimated light, light of which all the waves are travelling in parallel. It occurred to me that this must prevent them spreading out, and therefore render the Inverse Square Law void. This in turn got me thinking about more common fixtures – par cans, for example. Par lamps are so named for the Parabolic Aluminised Reflectors they contain. These collect the light radiated from the rear and sides of the filament and reflect it as parallel rays. So to my mind, although light radiated from the very front of the filament must still spread and obey the Inverse Square Law, that which bounces off the reflector should theoretically never diminish. 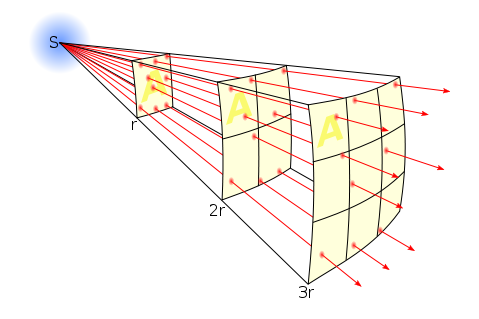 You can imagine that the ‘A’ square in our first diagram would have the same number of light rays passing through it every time if they are travelling in parallel. 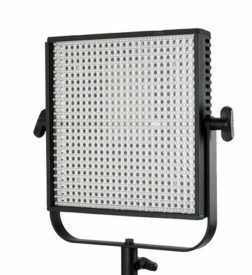 Even simple open-face fixtures have a reflector which can be moved back and forth using the flood/spot control, affecting both the spread and the intensity of the light. Hopefully by now you can see why these two things are related. More spread = more divergence of light rays = more fall-off. Less spread = less divergence of light rays = more throw. So, I wondered, am I right? Do these focused sources disobey the Inverse Square Law? To find the answer, I waded through a number of fora. Firstly, and crucially, everyone agrees that the Law describes light radiated from a point source, so any source which isn’t infinitely small will technically not be governed by the Law. In practice, says the general consensus, the results predicted by the Law hold true for most sources, unless they are quite large or very close to the subject. 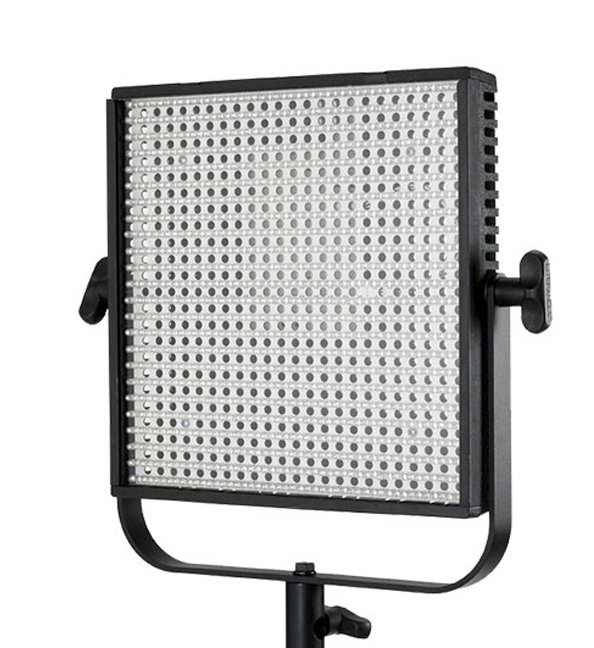 If you are using a softbox, a Kinoflo or a trace frame at short range though, the Inverse Square Law will not apply. In general, the light will fall off as 1/d² if the size of the light source is negligible compared to the distance d to the light source. 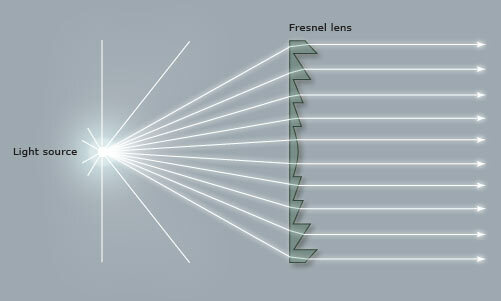 If, on the other hand, the light source is significantly larger than the distance d to the light source, the light will fall off as 1/d – in other words: slower than the Inverse Square Law predicts. Another contributor, Ftir, claims that a large source will start to follow the Law above distances equal to about five times the largest side of the source, so a 4ft Kinoflo would obey the Law very closely after about 20ft. 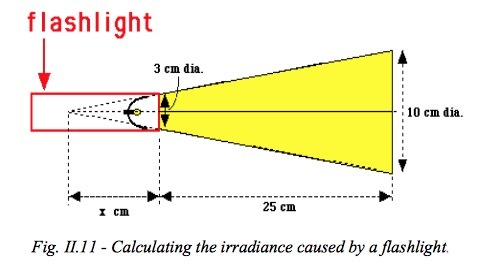 This claim is confirmed by Wikipedia, citing A. Ryer’s The Light Measurement Handbook. But what about those pesky parallel light beams from the pars and fresnels? Every forum had a lot of disagreement on this. Most people agree that parallel light rays don’t really exist in real life. They will always diverge or converge, slightly, and therefore the Law applies. However, many claim that it doesn’t apply in quite the same way. 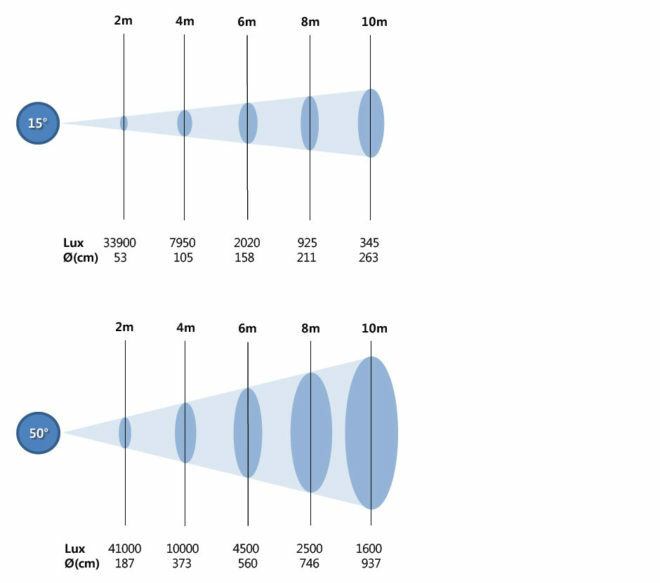 Diagram from a tutorial PDF on light-measurement.com showing a virtual point source behind the bulb of a torch. 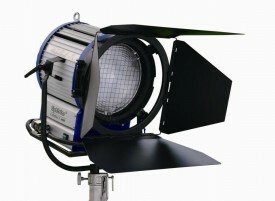 A fresnel, according to John E. Clark on Cinematography.com, can still be treated as a point source, but that point source is actually located somewhere behind the lamp-head! It’s a virtual point source. (Light radiating from a distant point source has approximately parallel rays with consequently negligible fall-off, e.g. sunlight.) So if this virtual source is 10m behind the fixture, then moving the lamp from 1m from the subject to 2m is not doubling the distance (and therefore not quartering the intensity). In fact it is multiplying the distance by 1.09 (12÷11=1.09), so the light would only drop to 84% of its former intensity (1÷1.09²=0.84). As you can see, at full flood (bottom graphic) the Law is obeyed as expected; the 8m intensity of 2,500 lux is a quarter of the 4m intensity of 10,000 lux. But when spotted (top graphic) it falls off more rapidly. Again, very confusing, as I was expecting it to fall off less rapidly if the rays are diverging but close to parallel. A more rapid fall-off suggests a virtual point source somewhere in front of the lamp-head. This was mentioned in several places on the fora as well. 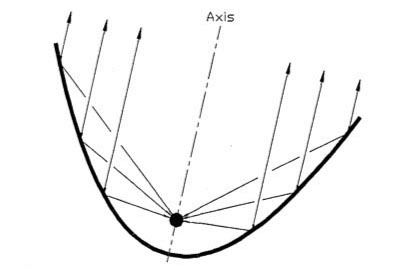 The light is converging, so the intensity increases as you move further from the fixture, reaching a maximum at the focal point, then diverging again from that point as per the Inverse Square Law. In fact, reverse-engineering the above data using the Law tells me – if my maths is correct – that the focal point is 1.93m in front of the fixture. Or, to put it another way, spotting this fixture is equivalent to moving it almost 2m closer to the subject. However, this doesn’t seem to tally with the beam spread data in the above graphics. More confusion! I decided to look up ETC’s Source Four photometrics, since these units contain an ellipsoidal reflector which should focus the light (and therefore create a virtual point source) in front of themselves. However, the data shows no deviation from the Law and no evidence of a virtual point source displaced from the actual source. I fear this investigation has left me more confused than when I started! Clearly there are factors at work here beyond what I’ve considered. However, I’ve learnt that the Inverse Square Law is a useful means of estimating light fall-off for most lighting fixtures – even those that really seem like they should act differently! If you double the distance from lamp to subject, you’re usually going to quarter the intensity, or near as damn it. And that rule of thumb is all we cinematographers need 99% of the time. If in doubt, refer to photometrics data like that linked above. And if anyone out there can shed any light (haha) on the confusion, I’d be very happy to hear from you! 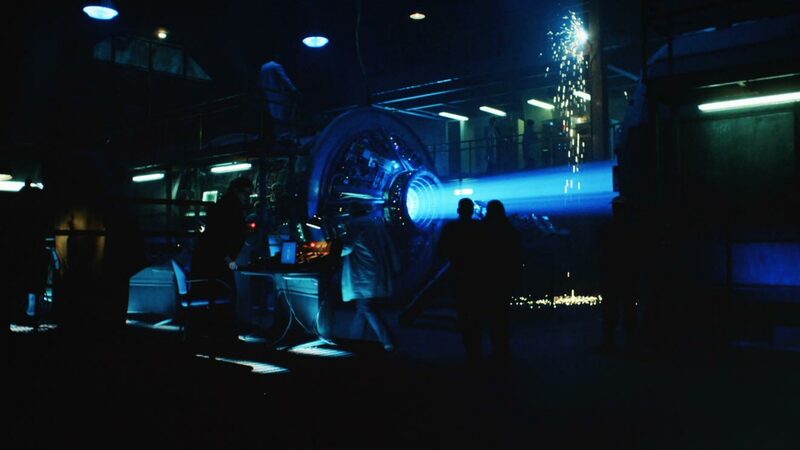 The latest episode of Lighting I Like is out, analysing how the “Splinter Chamber” set is lit in time travel thriller 12 Monkeys. This adaptation of the Terry Gilliam movie can be seen on Netflix in the UK. I found out lots about the lighting of this scene from this article on the American Society of Cinematographers website. It didn’t mention the source inside the time machine though, but my guess is that it’s a Panibeam 70, as used in the Cine Reflect Lighting System. New episodes of Lighting I Like are released at 8pm BST every Wednesday. Next week I’ll look at two scenes from Preacher. Click here to see the playlist of all Lighting I Like episodes. 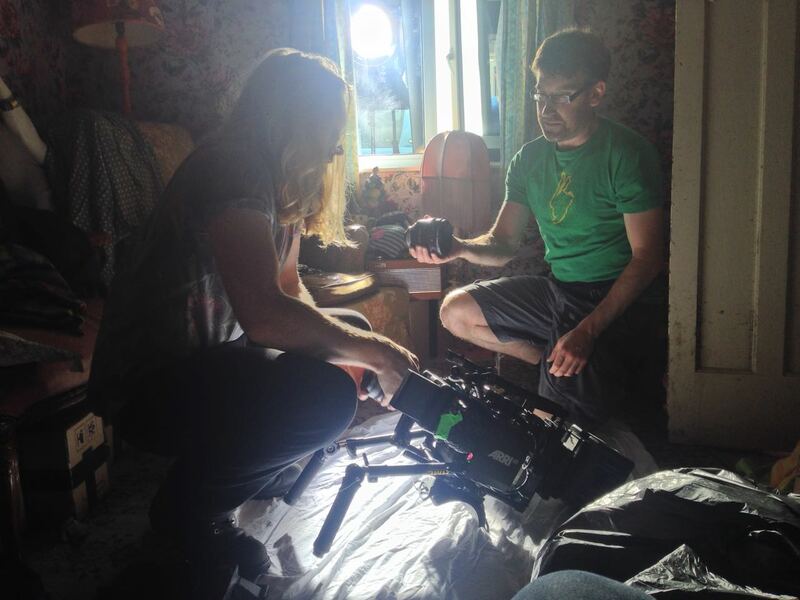 The first step in lighting a daytime interior scene is almost always to blast a light through the window. 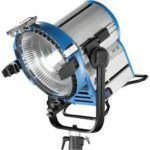 Sometimes soft light is the right choice for this, but unless you’re on a big production you simply may not have the huge units and generators necessary to bounce light and still have a reasonable amount of it coming through the window. So in low budget land, hard light is usually the way we have to go. Now, I used to think that this hard window light had to hit the talent’s faces, otherwise what’s the point? But eventually I learnt that there are many things you can do with this light…. 1. Light the talent directly. This is what I always used to do. The problem is that the light will be very harsh. If there is a good amount of natural light coming in through the window too, that might soften the look enough. 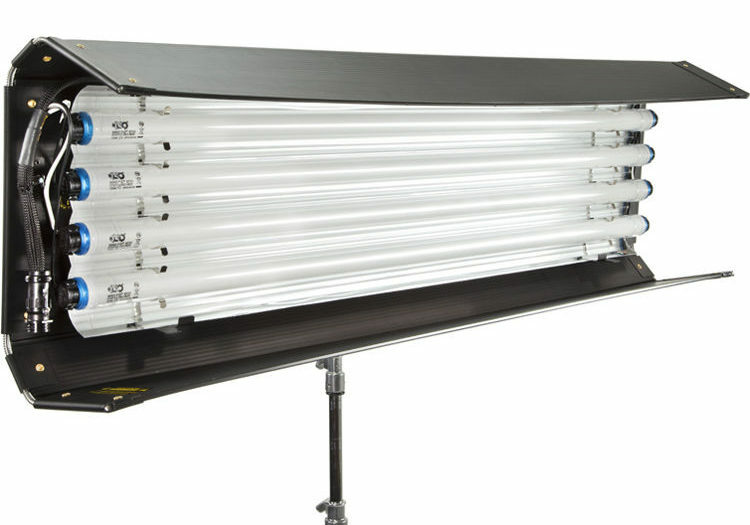 If not, slipping a diffusion frame in front of the light will take the edge off the hardness. And it depends which way the talent is facing. If the hard light is backlighting or edging them, the effect might well be beautiful. 2. Light part of the talent directly. This is a nice way to get the best of both worlds. You hit their clothes with the hard light, maybe a bit of their chin too; it creates contrast, brings out the texture in the costume, and adds dynamics because as the talent moves, the edge of the hard light will move around on them. 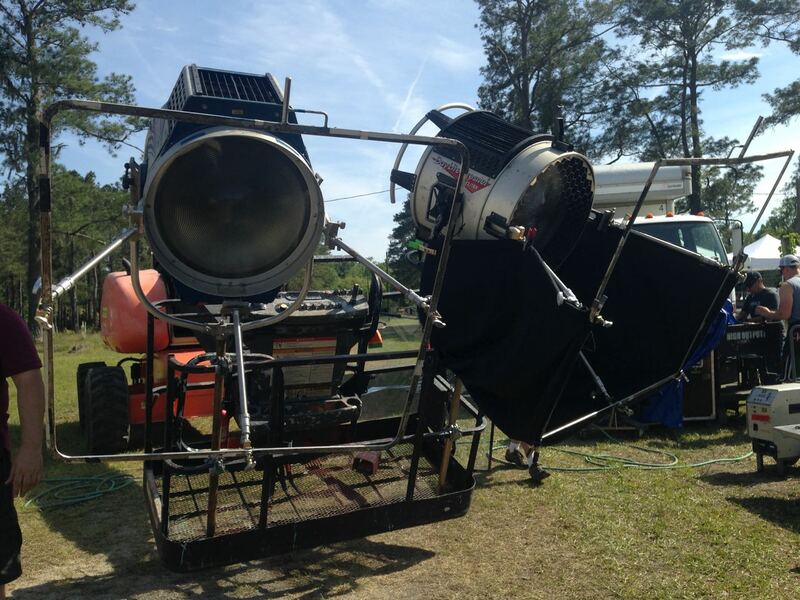 To light the parts which the hard source doesn’t hit you can use bounce, or a kinoflo Window Wrap. Arrange the light so it hits the floor, creating a skip bounce. Unless the floor’s a very dark colour, the light will bounce back up and light your talent softly from below. While some people are afraid of the “monster” look of lighting from below, it can often produce a very beautiful look. It’s well worth exploring. Alternatively, bounce the hard window light off a wall to create a soft side light. This photo from the set of Above the Clouds (director: Leon Chambers) shows a white sheet which I laid on the floor to skip-bounce the HMI outside the window. A hot splash of “sunlight” on the background is a common way to add interest to a wide shot. It can show off the production design and the textures in it, or help frame the talent or separate them from the background. Sometimes the most effective way to use a shaft of light through a window is simply as background interest. Volumize the light using smoke, and it creates a nice bit of contrast and production value in the scene. Silhouetting characters in front of the beam can be very effective too. Any that I’ve missed? What are your techniques for lighting through windows? 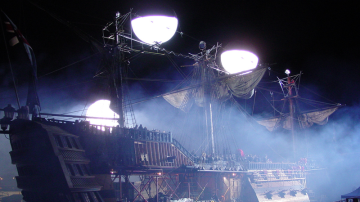 Welcome to the first in a series of posts looking at the many types of lighting instruments in use on film and TV sets today. 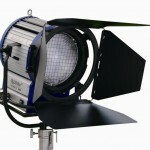 This is not intended to be an exhaustive or comprehensive list, but it will give you a good idea of your options, particularly if you’re moving up from smaller productions – where lighting kit is mostly borrowed – to larger ones, where you’re required to submit a lighting list to a rental house. Lamps can be divided into categories according to the means by which they produce light. Here is an overview of the main types. Incandescent lamps work by passing electrical current through a wire filament which becomes so hot that it glows. In the film industry they are generally referred to as ‘tungsten‘ units after the metal which the filament is made from. Common tungsten lamps include Dedolites, 1K ‘babies’ and open-face 800W and 2KW units (which have misogynous nicknames I shall not repeat here). The HMI (hydragyrum medium-arc iodide) is the most common form of high intensity discharge lamp used in the industry. It operates by creating an electrical arc between two electrodes which excites a gas. 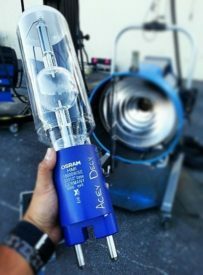 You may occasionally hear about an MSR (medium source rare-earth), which is slightly different technology, but as far as a cinematographer is concerned MSRs and HMIs are the same. 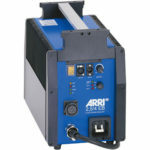 They require a ballast to ignite the arc and regulate the current and voltage. Fluorescent lamps are found almost everywhere today, as strip lights in supermarkets and offices, and energy-saver bulbs in the home. Similar in principle to HMIs, electric current causes mercury vapour to emit UV light which is translated into the visible spectrum by the phosphor coating on the tube. Kino Flo pretty much has the monopoly on fluorescent lighting for the film industry. Like HMIs, fluorescents require a ballast. 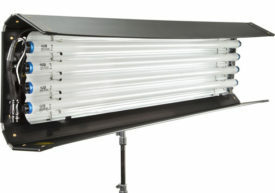 Gradually replacing tungsten as the most common lamps found on no-budget shoots, LED (light emitting diode) units contain semi-conductors that emit light when their electrons reconfigure. The technology is advancing rapidly, but there is currently a wide range of LED lamps on the market, varying greatly in price and corresponding quality. 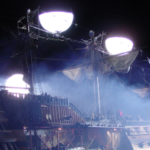 Though there are other types of lighting, like xenon, metal-halide and HEP (high efficiency plasma), the above four are the main ones you will encounter on film and TV sets today. Over the next few weeks I’ll look at each of those types in more detail, listing many of the specific units available in each category and their applications. 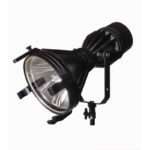 By the way, if your budget is too tight to hire film lamps of any kind, you may want to check out my post on lighting without movie lamps.